I am trying to create the same figure as the one posted in here (see reply) but centered around a different point than (0,0). Any suggestion? Sure. Define a coordinate which should be the center point, state this first to all commands and then add a + before each coordinate. The plus sign makes the following coordinate relative to the one without a plus sign which then is exactly what you want. 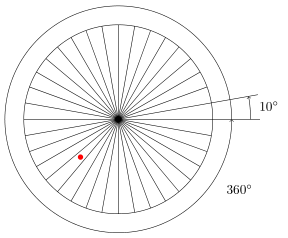 See Heiko's modified code to which I also added a red circle at (0,0) to prove that the center really is not there any more, but at the defined coordinate (A). Here is another possibility : define a pic that you can place where you want after that. This is interesting only if you need to place the wheel multiple times. How to draw a diagram in LaTeX? How do you create a keyhole contour not centered at the origin?